Badminton is one of five sports to lose all UK Sport funding for the 2020 Olympics in Tokyo - after Britain claimed a bronze in the sport in Rio. Archery, fencing, weightlifting and wheelchair rugby have also missed out. Cycling - which brought Team GB 12 medals in Rio - has had its funding cut by more than £4m to £25.98m. Badminton England chief executive Adrian Christy said he was "staggered" by the "incomprehensible" decision to remove the sport's funding. A total of £345m will be invested in 31 Olympic and Paralympic sports - £2m less than the record £347m allocated for the Rio Games. 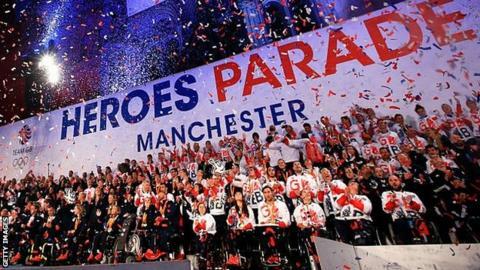 As a result, UK Sport has set Team GB a target of winning 51-85 Olympic medals, and 115-162 Paralympic medals in Tokyo. Britain enjoyed unprecedented success at Rio 2016, with the Olympics yielding 67 medals and the Paralympics 147. Chair of UK Sport Rod Carr said the government, which provides funding alongside National Lottery money, has "confirmed its commitment" for Tokyo 2020. He added: "These are critical funding decisions for sports to take them on their journey to Tokyo 2020 and beyond so the historic success at Rio can be maintained." Badminton, which was set a target of winning a medal in Rio, is the only sport that earned a podium place in the summer to have its funding removed. Marcus Ellis and Chris Langridge took bronze in the men's doubles after the sport was given £5.74m in the last cycle. Christy said the decision represents a "catastrophic impact on the sport" and Badminton England would "fight for the hopes and dreams" of its players. "How can you return from the best Games for more than a decade, in a year where our players have demonstrated world-class performances and where we can demonstrate the journey to Tokyo is on track, only be to have every penny of investment withdrawn?" he said. "What have we done wrong?" added GB Badminton's performance director Jon Austin. Judo, which was given the same target as badminton and also claimed one bronze medal, has had its funding increased slightly. Liz Nicholl, CEO of UK Sport, said the decision to cut funding was not taken lightly. "We would like to invest in every sport but the reality is we have to prioritise to protect and enhance the medal potential," she said. "If we under-invest across the board then the British teams will ultimately underperform at the Games and medal success will be put at risk." Sports minister Tracey Crouch added: "UK Sport's approach to elite sport has proven successful in Beijing, London and Rio and the ambition to win more medals in Tokyo is a bold one that, if achieved, would mean a sensational summer of sport in 2020." Basketball had its funding withdrawn in 2014 - and handball and volleyball lost theirs in 2012 - but say a UK Sport review last year to build "performance pathways for future success" was supposed to be aimed at such sports. A British Basketball statement, in conjunction with volleyball and handball, said: "It appears that UK Sport has no interest in team sports and in particular refuses to take responsibility for the need to fund their performance development, which was identified in its own review. "With UK Sport's investment budget approaching £350m, it borders on intransigence to pass responsibility to government and other funding bodies who are not set up to fund the development of high-performance sport." British weightlifting said they were "shocked and devastated" by the decision and also confirmed they will "explore all options regarding an appeal". What's new for Tokyo 2020? UK Sport says investment in the five Olympic sports and two Paralympic sports added for Tokyo 2020 is yet to be confirmed. Baseball/softball will return to the programme, with karate, skateboard, sports climbing and surfing also added, while Para-taekwondo and Para-badminton join the Paralympic programme. UK Sport says funding will be determined "following further exploration of medal potential", with £9m of the £345m total still to be allocated. Liam Carroll, head coach of the GB baseball team, said: "The key to unlocking our potential is investment and I'm pleased that UK Sport has left the door open. "We look forward to the opportunity to impress upon them that getting behind Great Britain Baseball can extend their tremendous track record of investing in Olympic medal contenders." Who are the Britons to watch in Tokyo 2020's new sports? New sports, new stars for Tokyo 2020? Just how Great were Britain in Rio? Read more on Rio 2016 Olympics: Just how Great were Britain?